This season for me is all about keeping warm and cosy, whilst sticking to a minimal style that requires very little effort. Call it laziness or some sort of hibernation instinct, but when the weather cools down I'm all about skinny jeans and jumpers/sweatshirts, especially oversized ones that will happily hide my food baby from all the indulgence in comfort foods (yes I know I'm extremely "fashionable"). 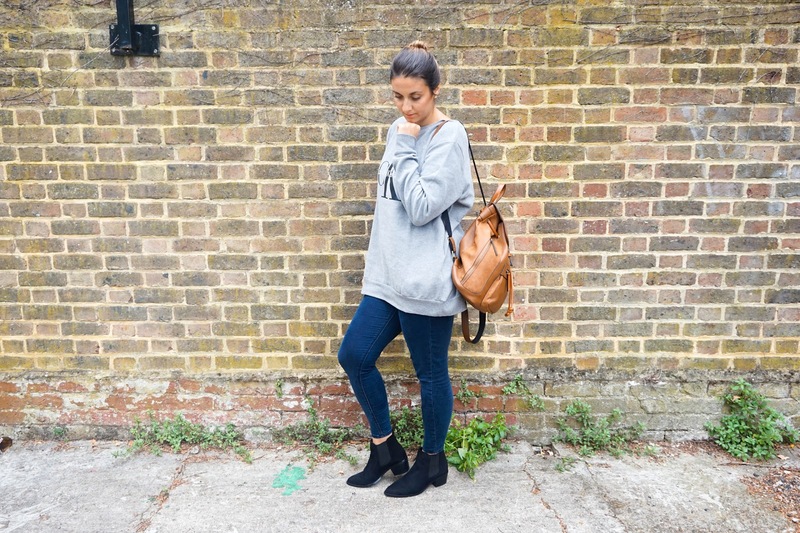 End the outfit with a comfy pair of ankle boots and I am ready for whatever autumn may throw my way. So for today's outfit post I thought I would put together some of my latest wardrobe additions to show you my go-to casual style for autumn. I actually got these Topshop Joni Jeans from my sister over the summer (don't you just love swapping clothes) and they are the comfiest jeans ever. The material is super stretchy, so it kind of just follows your natural curves without any discomfort. Not to mention that once they are on there's no pulling them up on a constant basis, since they just mould on your shape. Plus did I mention they are ultra high-rise?! I pretty much don't even bother trying on jeans anymore if they are low rise, because high waisted are the best for hiding any kind of 'mum-tum'. These are my first pair of Topshop jeans and I am finally seeing what all the hype is about. I'm now extremely tempted to check out the other styles of jeans available.... do you have a favourite style from Topshop? 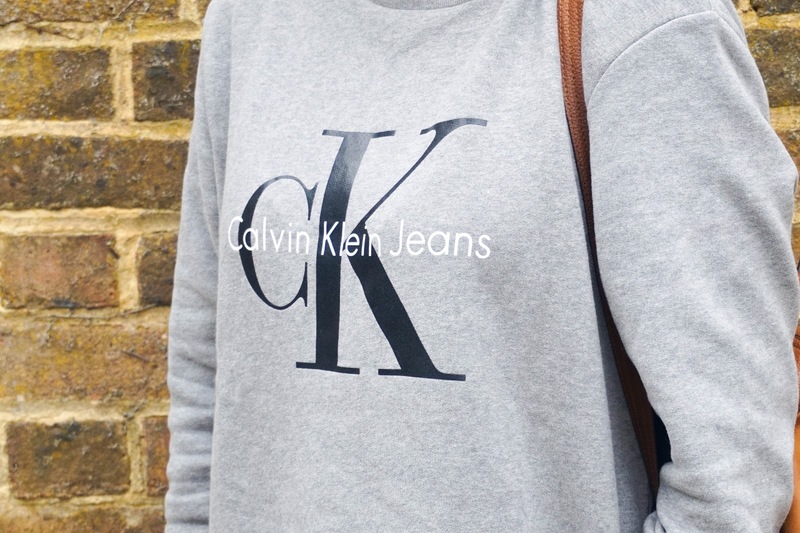 The next focus is on this Calvin Klein Grey Sweatshirt*, which I received through a mystery package. I genuinely have no idea who sent it over, there was no sender address but it was addressed in my name all the same. However it's in a size Large, which I would never order so I'm still quite bewildered by the whole process. Despite the size issue, I actually love the simple design of this sweatshirt and it's safe to say that it's my first piece of designer brand wear. 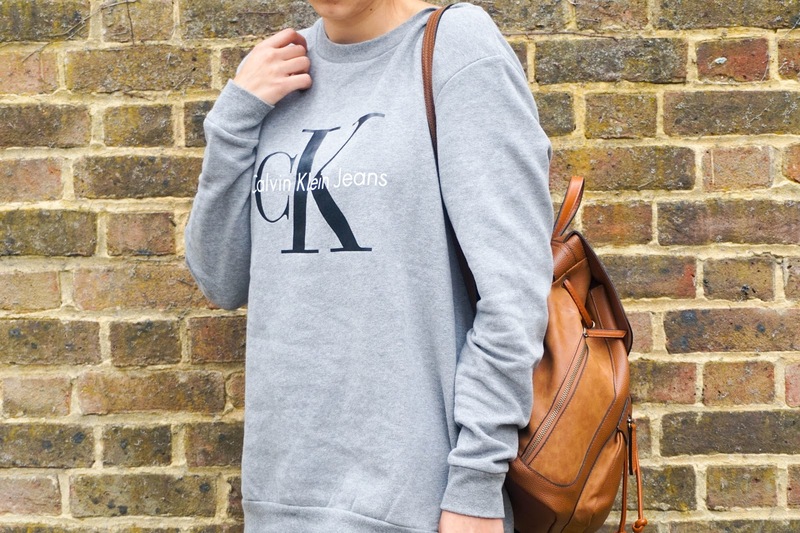 The material feels super soft, especially on the inside where it's extra fluffy... making it perfect for cosy days. If I could have chose this I would still prefer a smaller size but the large isn't too bad and I can still make it work for me as an oversized sweatshirt. I could also see myself wearing this with a pair of black leggings since the larger size covers my bum quite well and I could get away with it. 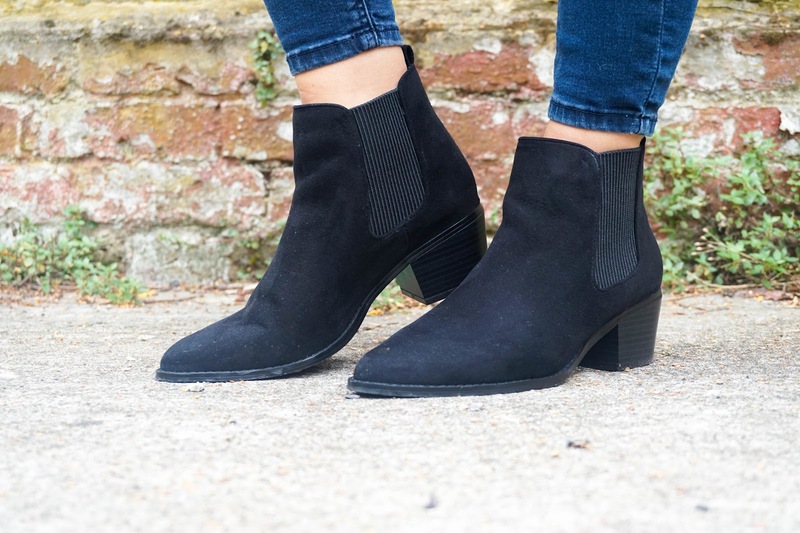 Lastly I've got a new pair of ankle boots from Head Over Heels by Dune, which I picked out from House of Fraser recently. Before I even tried on the Perina Point Chelsea Boots*, I easily pictured myself wearing them for most of autumn and upcoming winter too. 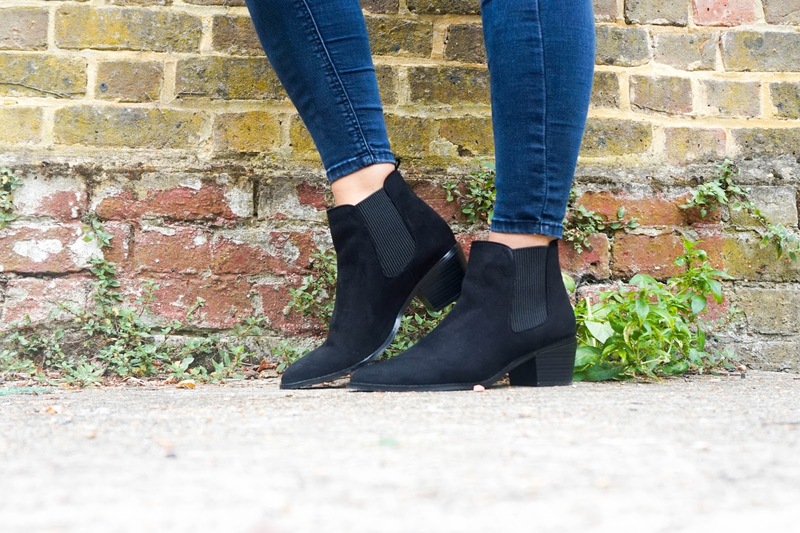 They are my perfect kind of style for boots: ankle length, suede material, pointed toe and a block heel design. They also feature elasticated side panels and a pull up tab, so you can just pop them on effortlessly. Best of all they are super comfortable to wear, even for a long day out spent walking and playing with an energetic little lady. I finished off my outfit for the day with my favourite Accesorize Brown Leather Backpack, which I bought before the beginning of summer so I can't find it online anymore, however there's plenty of other style to choose from here. When you have a toddler, you must always carry a drink and a snack, not to mention some sort of toy or game, with at all times. Having a backpack like this means I am able to pack in what I need for a day out without hurting my shoulder or having a larger handbag in the way... it's the perfect mommy bag in my opinion and this option looks pretty stylish too (if I do say so myself). So that's it from my usual casual style, which you will most likely find me sporting all autumn and winter long. 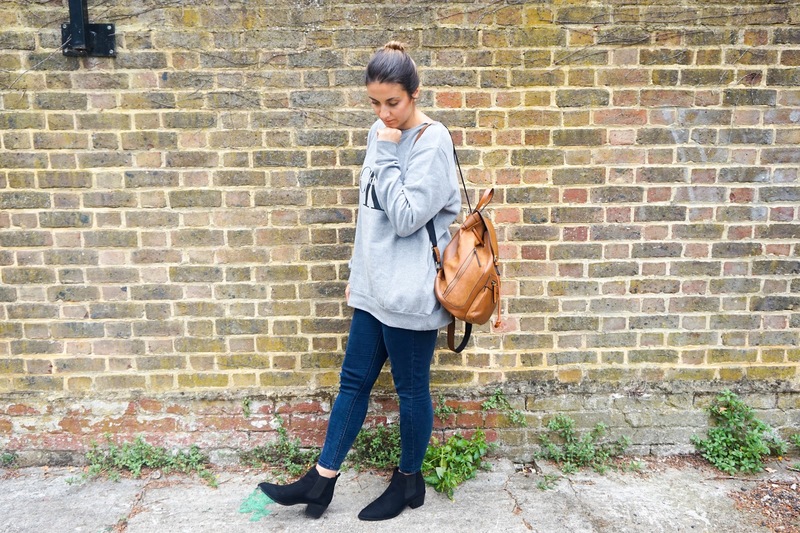 I'd love to hear all about your casual style for autumn, what's your must have pieces?